Special Form of Jewish Oath. German town in the province of Rhein-Hessen. 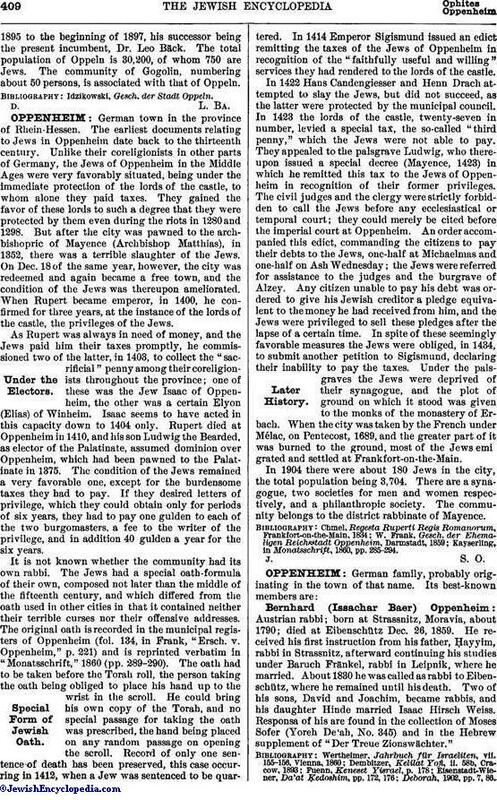 The earliest documents relating to Jews in Oppenheim date back to the thirteenth century. Unlike their coreligionists in other parts of Germany, the Jews of Oppenheim in the Middle Ages were very favorably situated, being under the immediate protection of the lords of the castle, to whom alone they paid taxes. They gained the favor of these lords to such a degree that they were protected by them even during the riots in 1280 and 1298. But after the city was pawned to the archbishopric of Mayence (Archbishop Matthias), in 1352, there was a terrible slaughter of the Jews. On Dec. 18 of the same year, however, the city was redeemed and again became a free town, and the condition of the Jews was thereupon ameliorated. When Rupert became emperor, in 1400, he confirmed for three years, at the instance of the lords of the castle, the privileges of the Jews. As Rupert was always in need of money, and the Jews paid him their taxes promptly, he commissioned two of the latter, in 1403, to collect the "sacrificial" penny among their coreligionists throughout the province; one of these was the Jew Isaac of Oppenheim, the other was a certain Elyon (Elias) of Winheim. Isaac seems to have acted in this capacity down to 1404 only. Rupert died at Oppenheim in 1410, and his son Ludwig the Bearded, as elector of the Palatinate, assumed dominion over Oppenheim, which had been pawned to the Palatinate in 1375. The condition of the Jews remained a very favorable one, except for the burdensome taxes they had to pay. If they desired letters of privilege, which they could obtain only for periods of six years, they had to pay one gulden to each of the two burgomasters, a fee to the writer of the privilege, and in addition 40 gulden a year for the six years. It is not known whether the community had its own rabbi. The Jews had a special oath-formula of their own, composed not later than the middle of the fifteenth century, and which differed from the oath used in other cities in that it contained neither their terrible curses nor their offensive addresses. The original oath is recorded in the municipal registers of Oppenheim (fol. 134, in Frank, "Ersch. v. Oppenheim," p. 221) and is reprinted verbatim in "Monatsschrift," 1860 (pp. 289-290). The oath had to be taken before the Torah roll, the person taking the oath being obliged to place his hand up to the wrist in the scroll. He could bring his own copy of the Torah, and no special passage for taking the oath was prescribed, the hand being placed on any random passage on opening the scroll. Record of only one sentence of death has been preserved, this case occurring in 1412, when a Jew was sentenced to be quartered. In 1414 Emperor Sigismund issued an edict remitting the taxes of the Jews of Oppenheim in recognition of the "faithfully useful and willing" services they had rendered to the lords of the castle. In 1422 Hans Candengiesser and Henn Drach attempted to slay the Jews, but did not succeed, as the latter were protected by the municipal council. In 1423 the lords of the castle, twenty-seven in number, levied a special tax, the so-called "third penny," which the Jews were not able to pay. They appealed to the palsgrave Ludwig, who thereupon issued a special decree (Mayence, 1423) in which he remitted this tax to the Jews of Oppenheim in recognition of their former privileges. The civil judges and the clergy were strictly forbidden to call the Jews before any ecclesiastical or temporal court; they could merely be cited before the imperial court at Oppenheim. An order accompanied this edict, commanding the citizens to pay their debts to the Jews, one-half at Michaelmas and one-half on Ash Wednesday; the Jews were referred for assistance to the judges and the burgrave of Alzey. Any citizen unable to pay his debt was ordered to give his Jewish creditor a pledge equivalent to the money he had received from him, and the Jews were privileged to sell these pledges after the lapse of a certain time. In spite of these seemingly favorable measures the Jews were obliged, in 1434, to submit another petition to Sigismund, declaring their inability to pay the taxes. Under the palsgraves the Jews were deprived of their synagogue, and the plot of ground on which it stood was given to the monks of the monastery of Erbach. When the city was taken by the French under Mélac, on Pentecost, 1689, and the greater part of it was burned to the ground, most of the Jews emigrated and settled at Frankfort-on-the-Main. In 1904 there were about 180 Jews in the city, the total population being 3,704. There are a synagogue, two societies for men and women respectively, and a philanthropic society. The community belongs to the district rabbinate of Mayence. Kayserling, in Monatsschrift, 1860, pp. 285-294.